3-Day Workshop is all about valuable mentoring in a small group setting and help for 3 FULL DAYS! Over the course of 3 days, we will personally help you locate potential investments, evaluate their profitability and risk, and purchase investments. The success of each attendee is important to us. We've placed a list of requirements and guidelines below for those who wish to attend. Willingness to Learn: Forget what you know about Real Estate. One of the challenges we face is helping members unlearn much of what they believe about real estate. It’s important that attendees are willing to learn and come in with an open mind. Testimonial for TaxSaleSupport.com: Our experience and expertise will help you avoid mistakes, and successfully invest. We would like to document your success following the event. At least $5,000 of capital to work with: Tax Liens and Tax Deeds require less starting capital than most investments. To be successful with the Boot-Camp you will want to have at least $5,000 to get started with. Use this form if you have questions about the Bootcamp. TaxSaleSupport.com is an educational program. We do not offer legal or financial advice. 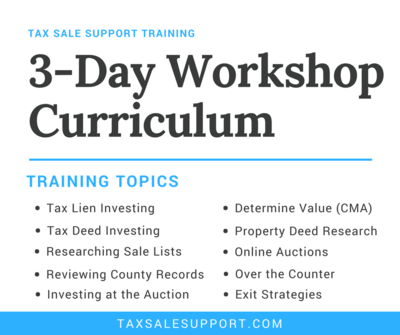 All programs and training included on this website are the property of Tax Sale Support LLC. All materials are copyrighted and the intellectual property of TaxSaleSupport.com. The ebooks and training manuals provided are for student use only, and can not be resold or copied without expressed permission. All tax sale lists are for student use only. TaxSaleSupport.com allows members to interact with other Members. Members are not allowed to solicit to other Members. TaxSaleSupport.com encourages all members to perform all necessary research before making any investments. TaxSaleSupport.com makes no claims regarding earnings. Cancellations must be made at least 72 hours prior an event. If cancellation occurs, a refund will be issued, minus a cancellation fee of $200. Unused funds may be applied towards future training and events.